It is so easy to become critical or negative when things don’t go exactly as we’d like, but most of us know that we are, in fact, incredibly blessed. We can choose, rather, to focus on what and who we are grateful for in any given situation, looking at the big picture, which will immediately make us feel better. Here are a couple of easy ways to incorporate gratitude into your day, which will boost your mood and that of those around you. Start your day with gratitude. Begin each day by mentally listing 3 people or things for which you are grateful. Don’t forget to include yourself! Maybe you are grateful that you’ve been practicing self-care and healthy eating regularly, or you have been carving out time each week to volunteer at a local animal shelter. Appreciate yourself for this and you’ll certainly be in good spirits. 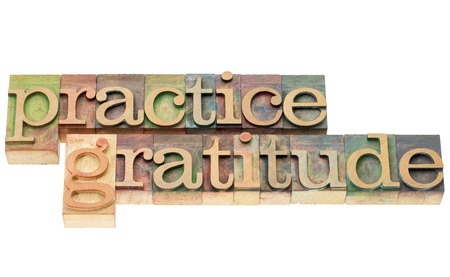 Express your gratitude. Take a few minutes each day or once a week to express your gratitude, whether in person, by phone, by email, or with a handwritten note. You’ll feel good by recollecting the act which inspired your gratitude, and the recipient will also feel good receiving your appreciation. A definite win-win! Meditation instructor Alice Lash offers mindfulness meditation in Miami. Check our Class Schedule and sign up today.